Tradies, we’ve made a number of ‘under the hood’ improvements to the way invoicing and credit card transactions are handled. When you next log in, you’ll notice a some new options on your home page. If you haven’t already, you can add a new credit/debit card. This makes it easier to keep on top of your payments and ensure you never miss an opportunity to chase a lead due to an overdue invoice. A revamped invoices section. View all pending/paid invoices, print invoices and easily access our bank account details to make payment by internet banking. Go Pro – it’s now easier than ever Go Pro with a streamlined process. 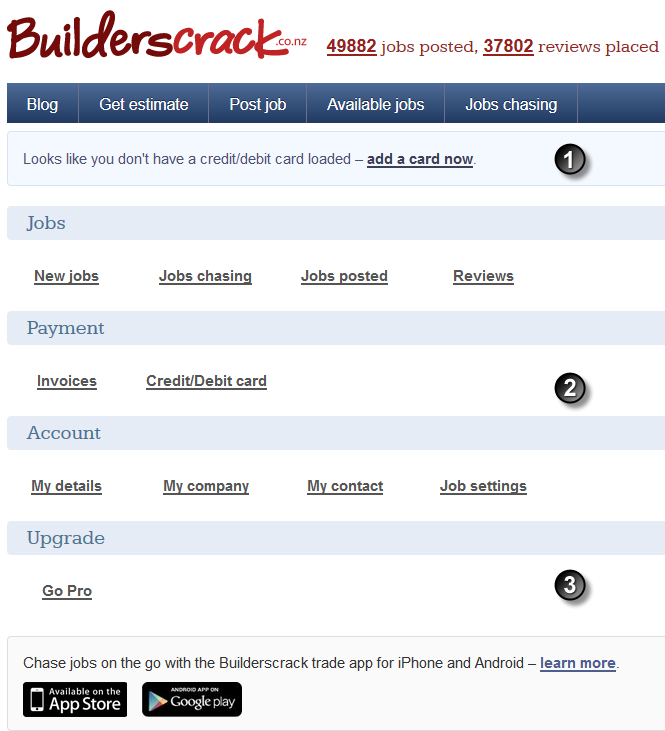 Visit our Tradesperson FAQ to find out about Builderscrack fees, invoicing and other topics.